Two proven technologies significantly assist commercial vehicle operators in keeping a close eye on what’s behind them. INTEC’s integration of radar sensors and video monitors enhance rear view capabilities well beyond the limited scope of mirrors. Besides helping operators to be aware of people and objects, they can conveniently view 125 degrees horizontal by 100 degrees vertical behind the vehicle. Read “Four Things to Consider Before Purchasing a Mobile Video Safety System” to gain further insights into the benefits of a reliable video safety system. When backing up, the radar sensor becomes activated and alerts the operator by sound and LED warning lights to pay extra attention to activity behind the vehicle. The video monitor provides a clear image of what is being detected by the radar sensor, which is a form of a passive radar system. For example, a driver, viewing the right view mirror while in reverse, is alerted from the sensor to look at the video monitor the second when a kid on a skateboard approaches from the sidewalk. Naturally, a driver has to know what’s happening on all sides of the vehicle. The radar sensor feature enhances the operator’s ability to see what’s behind the vehicle and make a quick stop when going in reverse. Whether it’s in a mine or on a neighborhood street, when applied correctly – every bit of technology ensures a consistent safety record for the fleet. To learn more about INTEC’s radar sensors, please contact one of our product specialists at (800) 468-3254. We would be pleased to answer your questions and help you achieve the highest standards of safety, quality and performance for your commercial vehicle fleet. Contributed by Dino Nama, Vice President at INTEC Video Systems, Inc.
To maintain optimal viewing behind commercial vehicles, operators need a video safety system that functions well in low light conditions and offers a wide field of view. Clearly seeing both night and day is a matter of life and death especially for operators of refuse collection, emergency, construction and mining vehicles. With lighting being a critical factor in video monitoring, LEDs on rear-view cameras raise a concern about systems used on commercial vehicles that are not designed for this purpose. There are many rear-view camera systems on the market that feature LEDs. Most of these models are based on fixed-site camera surveillance systems originally designed for baby nurseries and parking lots. They have been simply “repackaged” for use on commercial vehicles. Operations involving commercial vehicles are anything but static. Unfortunately, the illumination produced by LEDs installed on rear-view camera systems covers only a short distance behind the vehicle. LEDs inhibit operators from clearly viewing detailed images on their monitors at an ideal range field of view, 125 degrees horizontal and 100 degrees vertical. LEDs also have a tendency to produce a bright spot effect in the center of the image on the monitor. The contrast between bright center and surrounding dark area makes it harder for operators to see. Companies address these problems by narrowing the rear-view camera’s field of view, which significantly compromises safety when operators cannot observe half of what they need to see when backing up. Click here to learn more about LEDs used on rear-view camera systems. Rear-view camera systems work effectively in commercial vehicle applications when they are designed and manufactured to meet these rigorous work environments. From dense forests and tunnels to business districts and residential neighborhoods, the rear-view camera system must be the “eagle” eyes of the operator both day and night to ensure the highest standards of safety. At night, in a worst case scenario, the vehicle’s working backup lamps should provide enough illumination needed for a rear-view camera system to give the operator a clear view of activity behind the vehicle. The camera system should have the light sensitivity to operate in low light conditions, and at the same time, offer the operator a wide field of view. When properly mounted, the camera system should enable the operator to see both day and night everything from the bumper to about 15 meters away from the vehicle, and one meter out from each end of the bumper. 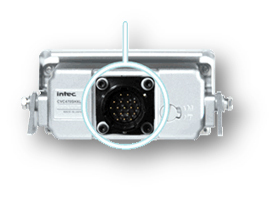 Instead of using LEDS, INTEC relies on high-quality components in its rear-view camera systems. Our systems are designed for one purpose only—to enhance safety for commercial vehicle applications. Strong video images covering a wide field of view are generated during the day and at night with the illumination from a working pair of backup lamps. INTEC systems cover the widest view in the industry (125 degrees horizontal by 100 degrees vertical). Again, when properly mounted, the operator can clearly observe the scene behind the vehicle. No compromise. The question is why would fleet managers want their vehicles equipped with anything other than a camera system specifically designed for commercial field applications? To learn more about the performance of INTEC rear-view camera systems, please contact one of our product specialists at (800) 468-3254. We would be pleased to answer your questions and help you achieve the highest standards of safety, quality and performance for your commercial vehicle fleet. The long train of Northwest storms cannot deter the work of an ambulance driver in Spokane, Washington. The driver’s ability to easily recognize hazards around the EMS vehicle and work around them is critical to ensuring safety during rescues. While operating in constant inclement weather, the driver has complete confidence in the INTEC backup camera system installed on the vehicle. The camera’s Ingress Protection Rating (IP) makes this peace of mind possible. The rating is from an accredited third-party organization (ISO/IEC), which subjects INTEC systems to a rigorous series of performance tests to certify that the product meets and operates under the conditions of the Ingress Protection Rating. Ingress Protection rates and classifies the degree of dust intrusion and water protection of electrical enclosures. The rating lists two numbers to state the level of protection from the elements. The first number relates to dust-size particles while the second number relates to moisture. The rating range is from “zero” (no protection) to “six” (completely dust tight) and “eight” (waterproof and submergible down to depths over 1 meter). Click here to learn more about the IP Rating. INTEC’s cameras and displays along with the H and XL series controllers have a rating of IP68, which means they are both completely dustproof and waterproof. Simply said, an accredited third party has conducted its tests according to standards established by ISO/IEC to certify that INTEC’s video safety systems meet the performance and operating standard necessary for commercial vehicle applications. While on the topic of certification, it’s important to understand the difference between tricky sales tactics and valid third party certification. There are a lot of products being marketed as ‘waterproof’ or even IP69K (that’s a whole different story)! However, when you review the product’s technical information from the manufacturer, it clearly states otherwise, does not refer to the certifying body, or can’t produce a certificate of compliance to back up the statements made on the marketing materials or by their sales people. These suppliers are “banking” (literally) on the fact that customers don’t conduct in-depth research into the product’s performance qualities. All cameras are not the same. Some are ‘designed for purpose’ and others – most others are ‘one size fits all’ repackaged to make an appearance without any support or substance. INTEC proudly shows the certificate from the ISO/IEC, an accredited third-party organization that confirms the system meets and operates under the conditions of the performance standard. Products that state “compliant” or “meet” a certain performance standard should be viewed as a red flag to the potential buyer. Beware, this could be a self-proclaiming statement lacking the merits of a third-party certification. The buyer should always examine the fine print. As harsh winter conditions once again bear down on the nation, don’t you want your fleet to operate with a certified video safety system with proven reliability? To learn more about INTEC’s IP Rating, please contact one of our product specialists at (800) 468-3211. We would be pleased to answer your questions and help you achieve the highest standards of safety, quality and performance for your commercial vehicle fleet. Fleet managers often ask me why INTEC video safety systems for commercial vehicles are designed and manufactured to meet MIL-SPEC standardization. Their assumption is that it is very unlikely their trucks will ever operate in combat. This high standard is an assurance of reliability in applications when lives are in the balance—a necessity whether in peacetime or war. MIL-SPEC primarily relates to customized commercial equipment and instruments that have been proven to meet military expectations in harsh environments. Simply said, the equipment has undergone rigorous testing to prove that it works when it’s supposed to work. This essential principle applies as much to commercial applications as it does to military use. MIL-SPEC standardization demonstrates exceptional performance based on a series of tests that include durability (lines are connected and disconnected 200 times per minute) and the ability to function in wet, cold and hot conditions (the temperature range is -67 to +257 Fahrenheit). The equipment, as well as its connectors and seals, undergo heavy vibrations, fluid immersion and mechanical shock. Seals are also tested for air tightness, an important performance point for any camera system! We believe our clients deserve systems that meet this high standard. The distinction of the MIL-SPEC standardization offers many benefits for companies with a commercial vehicle fleet. Back-up cameras that meet military expectations ensure performance, reliability, availability and interoperability. Performance—INTEC video safety systems meet performance requirements and demands for the military. Proven performance means peace-of-mind for fleet managers because our back-up cameras seldom become a maintenance issue and demonstrate a high level of reliability to keep the fleet moving. Reliability—Compared to untested, inexpensive repackaged video systems on the market, INTEC systems are tested, qualified and certified to a proven performance standard. This feature significantly reduces costs related to repairs and system replacements. Our reliability helps companies maintain their commitment to quality for their customers. Availability—Unlike consumer-based video systems that are designed to become obsolete and unavailable after the course of a year, INTEC’s systems have a much longer life cycle with components available for fleets up to 25 years. Essentially, INTEC systems operate for the life of the vehicle. Interoperability—INTEC video safety systems/components purchased this year are guaranteed to be compatible with the INTEC systems purchased a decade ago or even longer. Having a fleet with compatible video systems saves time and money in the long run because of the interoperability and familiarity of systems in both new and old vehicles. Beware! There are some manufacturers that state on their websites and literature their products are “Designed for MilSpec” when there’s absolutely nothing further from the truth. You’ll be able to recognize the real value of a product that’s “in fact” designed, built, and certified with Mil Spec components and to Mil Spec standards. You should be able to “see” evidence of these quality standards in the product as opposed to them being only something a marketing department dreamed up. There’s a big difference between a statement and a certification. Rest assured, INTEC’s Car Vision® line of mobile video safety products is a proven system to meet your fleet’s needs. For more information about INTEC’s unwavering commitment to value, reliability and quality performance, please contact one of our product specialists at (800) 468-3254. It has been said that the best business plans focus totally on quality. At INTEC Video Systems, our quality is based on extensive experience in the application of video safety systems for commercial vehicles. For nearly 40 years, we have worked closely with companies to help make their operations involving large trucks safe and efficient. We know what works and what doesn’t work. In these industries, there is no room for gimmicks or short-cuts. INTEC Car Vision® Mobile Video Safety Products are designed specifically to aid drivers operating mining, construction, refuse collection, EMS and public transportation vehicles. Since day one, we understand that helping drivers conveniently view blind spots is a necessity. In a working environment where harsh conditions and distractions in the cab (laptop and sensors) are part of a normal working day, drivers appreciate how our design features, top quality components and overall technology enhance visibility and make their jobs safer and easier. Besides delivering a video safety system that drivers can depend on each day, INTEC sees its products as assets for driving a company’s revenue stream. Providing a high-quality system translates to minimal costs related to repairs and replacement parts. The INTEC team backs up its systems with all the necessary support to keep trucks in operation. It’s this high level of commitment that demonstrates that we do more than sell products; we establish relationships to ensure quality performance. As a result, INTEC fosters strong relationships with companies that have been using multiple generations of our product line in their fleets. These systems have been in operation 10 to 15 years or even longer depending on the vocational application. Again, it’s common for an INTEC system to operate efficiently for the entire service life of the truck. To learn more about INTEC Video Safety Systems and how it can make a difference in your company’s fleet operations, please visit www.intecvideo.com. Recently, one of our competitors announced the unveiling of its new backup camera that features a heater to enable it to function in the snow and rain. At INTEC Video Systems, Inc., we have been using heaters in our line of mobile video safety products for almost 40 years. Our extensive experience in rear view camera systems helps drivers operate commercial vehicles with peace-of-mind throughout the year. We learned a long time ago that condensation of moisture is possible in hot, cold or even mild weather conditions. With moisture being a major culprit of camera failure, we installed a heater inside the camera housing to keep it dry and prevent the glass window from fogging up. In winter climates, the heater is essential to keep the system operational. To further prevent moisture from damaging the system’s components, a proprietary material is used to seal the entire casing of the mobile video safety system. This industrial strength sealing even meets military specifications. This is an important layer of protection especially for the system’s camera windows and connectors. 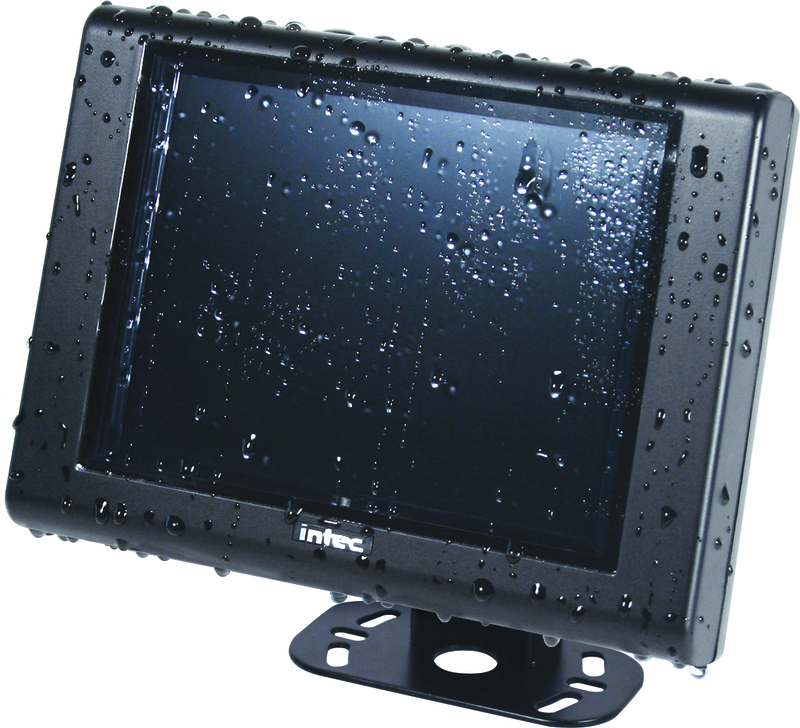 Even monitors are sealed because vehicle cabs have a tendency to get wet especially when drivers are frequently stepping in and out of their vehicles in the rain or snow. INTEC mobile video safety systems are IP68 certified to ensure protection from water intrusion. This third-party certification confirms that our systems can operate under a full meter of water for extended periods of time, and every component is fully water tank tested. These protective measures incorporated in INTEC systems are a cut above other camera and monitor systems on the market that are not designed specifically for industrial applications. Those systems, often based on consumer designs, consist of substandard materials, which become brittle over time and require frequent replacement. This is a significant financial issue when compared with the long-lasting durability of INTEC systems. In terms of reliability, these protective features incorporated into INTEC mobile video safety systems significantly enhance the commercial vehicle’s overall performance. The system helps drive revenue and efficiency for mining, construction, refuse collection, EMS and public transportation companies. A system designed to withstand demanding work environments makes a difference in safety and dependability that will support a vehicle throughout its operational life. To learn more about the reliability of the INTEC Car Vision® mobile safety systems, please visit www.intecvideo.com. How much does a mobile video safety system failure cost a company? The breakdown of a backup camera or display monitor on a large commercial vehicle is not just a problem for the driver. A broken system can send shockwaves of grief from the truck yard all the way up to the executive suite. The causes of the breakdown are often linked to the system’s substandard components and poor design. For example, refuse collection companies in California face significant revenue loss and hardships when one of their garbage trucks has to stop in the middle of its route because of a broken or faulty display monitor or camera. Many refuse collection companies have a policy that when a camera system is down, the truck is red-tagged and cannot work its route. If the camera stops working while on the route, the driver must discontinue operations. During these situations, the costs to repair the system and resolve the disrupted trash pickup schedules are substantial. These expenditures primarily involve sending mechanics out to do the repair work, as well as other costs related to replacement parts, new system purchases and labor overtime. These expensive incidents quickly gain the attention of a company’s upper management. As a proactive measure to guard against these unfortunate occurrences, it’s important for these key decision-makers to be in the loop when purchasing a mobile video safety system for their trucks. They need to carefully examine the system’s “life cycle cost,” which involves additional costs and revenue loss resulting from systems breaking down. What appears to be saving money in the short-term by purchasing the cheapest system ends up creating unexpected financial headaches in the long-term. INTEC Car Vision® systems are designed and built for the rigors that refuse collection vehicles face each day and have a proven average lifespan of eight and a half years. Compared with lower quality systems from other manufacturers that last approximately three years under ideal conditions, this is an important performance point for upper management to note. Superior optics and sensors, heavy-duty polyurethane cabling, as well as certified IP68 cameras, controllers, and displays ensure the reliability and performance of the INTEC Car Vision® line of mobile video safety systems. life cycle cost of the mobile video safety system currently being used in your company’s commercial vehicle fleet.